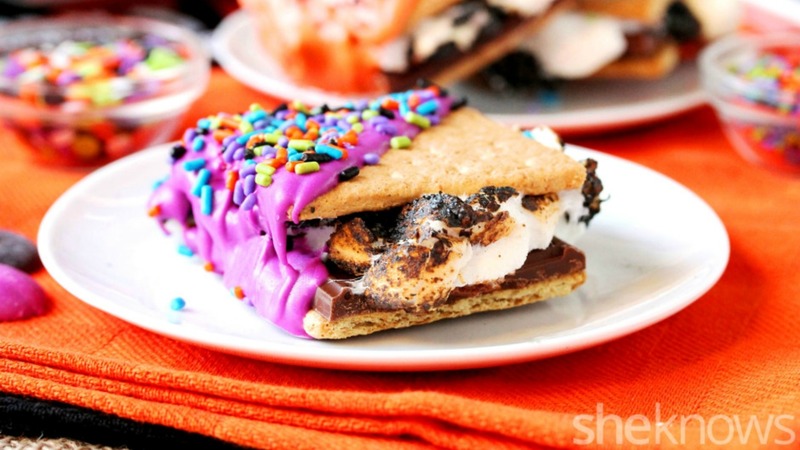 There are no drab-looking s’mores invited to this party. Just fancy ones that are dolled up with colorful candy coating and festive Halloween candy sprinkles. These yummies can be made ahead of time. Just warm them ever so slightly in the microwave before serving, and you’re in for a real treat. Decorate with bright purple and orange candy melts — or black or green. And of course the best part is digging in. Lay 1 milk chocolate bar (halved) on top of a graham cracker (halved). Lay 2 roasted marshmallows on top of the chocolate bar. 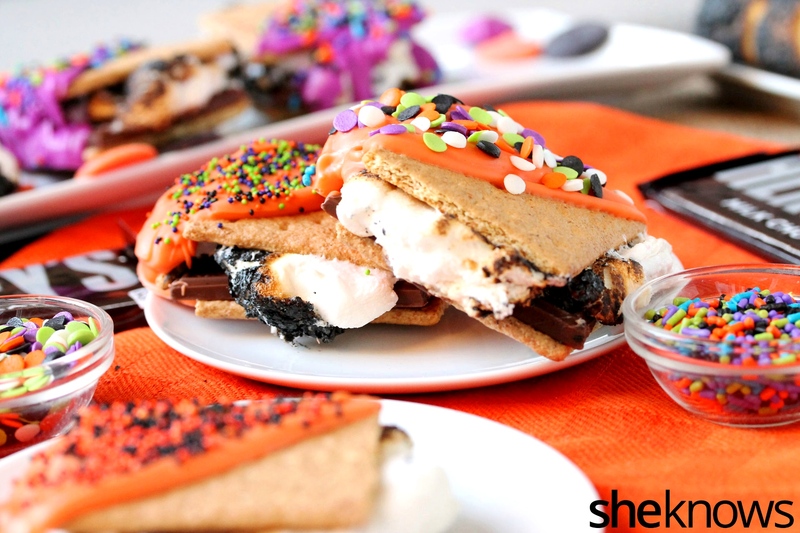 Top with another graham cracker (halved), and carefully push down to even out the roasted marshmallows over the chocolate. Repeat for the remaining graham crackers, chocolate and marshmallows. Line a large cookie sheet with parchment or waxed paper. 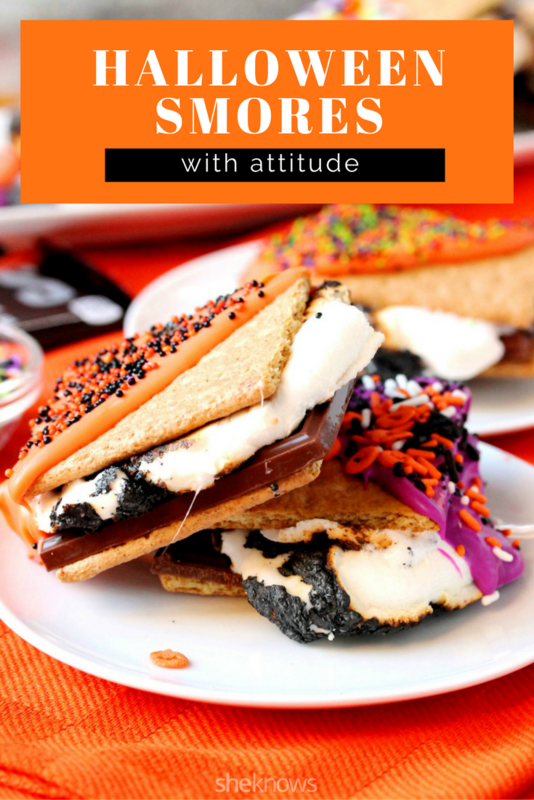 Dip half a s’more (diagonally) into the melted candy coating, and lay it on the lined cookie sheet (leaving room for the remaining s’mores). While the candy coating is still wet, add the candy sprinkles. Repeat for the remaining s’mores. Let chill in the refrigerator for about 20 minutes or until the candy coating is set. Just before serving, very, very slightly warm (try 6 seconds at a time; not more than approximately 12 seconds) in the microwave.